Product Lifecycle Management (PLM) has always been a tough pill for enterprises to swallow, even for the largest companies in sectors like automotive and Aerospace & Defense (A&D), which have been among the earliest adopters of the technology. While historically, there’s been no shortage of user interface enhancements and packaged templates and workflow customizations to ease deployment and improve accessibility, companies have continued to struggle to squeeze value out of PLM beyond its core roots as a souped-up repository for managing engineering data and change orders. Though clearly a marketing term, intelligent-driven design is Siemens’ moniker for shifting the focus of PLM from a pure repository for storing all product-related data (and Siemens officials say with today’s increasingly complex products, there’s a lot of it) to being a conduit for serving up relevant product information in the proper context and to the proper constituents without necessarily having to know or specify what exactly it is you’re looking for. Siemens has talked about some of the new technologies in earnest and made casual mention of others more recently. One of the better-known capabilities is Active Workspace, a highly visual, interactive environment that combines complex search capabilities and portal functionality to help users more easily find and access intelligent 3D information in order to make better informed decisions. HD-PLM is another critical piece of solving the accessibility puzzle. 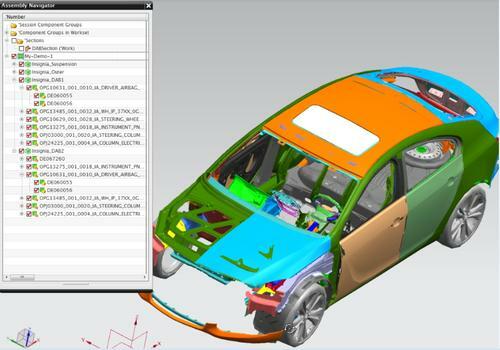 The technology, which encompasses Web 2.0 technologies like tagging and visual reporting along with new user interface constructs, including role-based portals, delivers a more intuitive and personalized PLM user experience, and is being folded into Siemens’ products such as NX 7, Teamcenter, and Tecnomatix.